Sirenia is an order of aquatic mammals, represented today by three species of manatees (family Trichechidae) and one species of dugong (family Dugongidae). Commonly referred to as "sea cows" for their grazing of vegetation, members of this order also are known collectively as sirenians and sirens. All four extant species are large, herbivorous, and fully aquatic, inhabiting swamps, rivers, estuaries, marine wetlands, and coastal marine waters. These mammals all have nearly hairless skin, paddle-like front flippers, ears without pinnae, and effectively no hind limbs, being reduced to only a vestigial pelvis. Manatees and dugongs are the only marine mammals classified as herbivores. The dugong is the only strictly-marine herbivorous sirenian, as all species of manatee utilize freshwater to some degree. The dugong is found in Indo-Pacific waters from eastern Africa to southeast Asia, while the manatees are found in both freshwater and marine environments in parts of the Americas and Africa. One representative, the Steller's sea cow (Hydrodamalis gigas) became extinct only since the 18th century. As the only marine mammals herbivores, sirenians fill a unique niche in food chains, being the largest primary consumer of aquatic vegetation, such as seagrass. However, the also have been hunted for food, leather, and other products, and their habitat developed for residential, commercial, and recreation use, to the point where populations have been severely limited. The three manatee species (family Trichechidae) and the dugong (family Dugongidae) are endangered species. All four are vulnerable to extinction from habitat loss and other negative impacts related to human population growth and coastal development, including destruction of seagrass beds by increased sedimentation. Steller's sea cow (Hydrodamalis gigas) provides a particularly sobering reflection on the severity of human impacts. Steller's sea cow has been extinct since 1786, just 27 years after its discovery in 1741, due largely to hunting by sailors/explorers provisioning their ships for long voyages. Sirenians are one of four extant groups of marine mammals, the others being cetaceans (whales, dolphins, and porpoises), sea otters, and pinnipeds (walruses, earless seals, and eared seals). The sirenians and cetaceans are completely aquatic, while pinnipeds spend considerable time on land, including giving birth and raising their young, and sea otters can mate and raise their young entirely at sea. Like dolphins and whales, manatees and dugongs are completely aquatic mammals that never leave the water—not even to give birth. Sirenia is thought to have evolved from four-legged land mammals over 60 million years ago, with the closest living relatives being the Proboscidea (elephants) and Hyracoidea (hyraxes) (Domning 1994). There are two extant families and four species in Sirenia: Trichechidae (three species of manatees, Trichechus inunguis, T. manatus, and T. senegalensis) and Dugongidae (one species, the dugong, Dugong dugon). 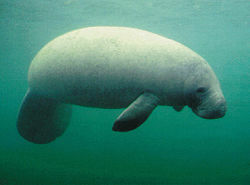 Sirenia also include Steller's sea cow, extinct since the 18th century, and a number of taxa known only from fossils. The order evolved during the Eocene, more than 50 million years ago. About 50 species in 4 families have been described in total as of 2006 (Self-Sullivan 2007). The oldest fossil records of sirenians, from the Middle Eocene, were placed in the family Prorastomidae and were amphibious quadrupeds (Self-Sullivan 2007). Sirenia, commonly "sirenians", are also referred to by the common name "sirens", deriving from the sirens of Greek mythology, which also were confused by authors and sailors with the mythical mermaids. Modern sirenians have major aquatic adaptations: the forelimbs have modified into paddle-like front flippers used for steering, the tail has modified into a paddle used for propulsion, and the hindlimbs (legs) are lacking with the exception of two small remnant (vestigial) bones floating deep in the muscle. Although sirenians appear fat, they are fusiform, hydrodynamic, and highly muscular. Their skulls are highly modified for taking breaths of air at the water's surface, and dentition is greatly reduced. Although mammals, they have nearly hairless bodies, and they lack external ears and have relatively small eyes. The nostrils, located on the top of their snouts, are closed by values, while their eyes are closed by a sphincter-like mechanism (Myers 2000). Their large and mobile lips are covered by stiff bristles (Myers 2000). Sirenians also experience pachyostosis, a condition in which the ribs and other long bones are unusually solid and contain little or no marrow. These heavy bones, which are among the densest in the animal kingdom (Waller et al. 1996), may act as a ballast, helping to neutralize the buoyancy of their blubber and keeping sirenians suspended slightly below the water's surface (Myers 2000). The lungs of sirenians are unlobed (Eldredge 2002; Dierauf and Gulland 2001). In sirenians, the lungs and diaphragm extend the entire length of the vertebral column. These adaptations help sirenians control their buoyancy and maintain their horizontal position in the water (Domning and Buffrenil 1991; Rommel and Reynolds 2000). The premaxillae of the skull are large and downward deflected and the tympanic bone in the region of the ear is semicircular (Myers 2000). Sirenians have only two teats, located under their forelimbs, similar to elephants. The elephants are thought to be the closest living relatives of the sirenians. The manatee appears to have an almost unlimited ability to produce new teeth as the anterior teeth wear down. Unlike the manatees, the dugong's teeth do not continually grow back via horizontal tooth replacement (Self-Sullivan 2007). The main visual difference between manatees and dugongs are the tails. A manatee tail is paddle-shaped, while a dugong tail is forked, similar in shape to that of a whale of dolphin. The fluked tail provides locomotion through vertical movement. The Trichechidae species differ from the Dugongidae also in the shape of their skull. Living sirenians grow between 2.5 and 4.0 meters long and can weigh up to 1,500 kg. Hydrodamalis gigas, Steller's sea cow, was huge (size of African elephants in weight, over 6000 kg) and could reach lengths of 8 m (Eldredge 2002; Myers 2000). Dugongs are generally smaller than manatees (with the exception of the Amazonian manatee), reaching an average adult length of 2.4 to 3 meters (8 to 10 feet) and a weight of 231 to 499 kilograms (510 to 1100 pounds) (NG 2014). An adult's length rarely exceeds 3 meters, and females tend to be larger than males. The largest known dugong was an exceptional female landed off the Saurashtra coast of west India, measuring 4.03 meters (13.3 feet) and weighing 1,018 kilograms (2,240 pounds) (Wood 1982). Manatees and dugongs are the only marine mammals classified as herbivores. Unlike the other marine mammals (dolphins, whales, seals, sea lions, sea otters, and walruses), sirenians eat primarily sea grasses and other aquatic vegetation, and have an extremely low metabolism and poor tolerance for especially cold water. Sirenians have been observed eating dead animals (sea gulls), but their diets are made up primarily of vegetation. These animals have been observed eating grass clippings from homes adjacent to waterways, but in this rare occurrence, only the top portion of the sirenian is lifted out of the water. The combination of these factors means sirenians are restricted to warm, shallow, coastal waters, estuaries, and rivers with healthy ecosystems that support large amounts of seagrass or other vegetation. The dugong is heavily dependent on seagrasses for subsistence. A "cultivation grazer," it feeds on the seagrass in a manner that actually promotes regrowth of the seagrass, though aerating the sea floor and increasing the amount of organic matter in the area. The huge Steller's sea cow, which lived in the Bering sea, feed exclusively on seaweed. The order Sirenia has been placed in the clade Paenungulata, within Afrotheria, grouping it with two other orders of living mammals: Proboscidea, the elephant families, and Hyracoidea, the hyraxes, and two extinct orders, Embrithopoda and Desmostylia. Dierauf, L., and F. Gulland. 2001. Marine Mammal Medicine. CRC Press. ISBN 0849308399. Domning, D., and V. Buffrenil. 1991. Hydrostasis in the Sirenia: Quantitative data and functional interpretations. Marine Mammal Science 7(4): 331–368. Eldredge, N. 2002. Life on Earth: An Encyclopedia of Biodiversity, Ecology and Evolution. ABC-CLIO. ISBN 157607286X. Marsh, H. 2008. Dugong dugon. 2013 IUCN Red List of Threatened Species. Retrieved on February 5, 2014. Marsh, H., H. Penrose, C. Eros, and J. Hugues. 2002. Dugong: Status reports and action plans for countries and territories. IUCN. Retrieved February 5, 2014. Myers, P. 2002. Dugongidae. Animal Diversity Web. University of Michigan Museum of Zoology. Retrieved February 5, 2014. Myers, P. 2000. Sirenia. Animal Diversity Web. University of Michigan Museum of Zoology. Retrieved February 5, 2014. National Geographic (NG). 2014. Dugong. National Geographic. Retrieved February 5, 2014. Rommel, S., and J. E. Reynolds. 2000. Diaphragm structure and function in the Florida manatee (Trichechus manatus latirostris). The Anatomical Record 259(1): 41–51. PMID 10760742. Self-Sullivan, C. 2007 Evolution of Sirenia. sirenian.org. Retrieved February 5, 2014. Shoshani, J. 2005. Dugong. In D. E. Wilson, and D. M. Reeder (eds. ), Mammal Species of the World, 3rd ed. Johns Hopkins University Press. ISBN 0801882214. Waller, G., M. Burchett, and M. Dando. 1996. SeaLife: A Complete Guide to the Marine Environment. Washington, D.C.: Smithsonian Institution Press. ISBN 1560986336. This page was last modified on 21 February 2014, at 01:17.